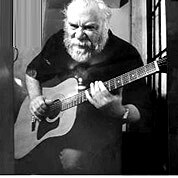 John Fahey was an American fingerstyle guitarist and composer who pioneered the steel-string acoustic guitar as a solo instrument. His style has been greatly influential and has been described as the foundation of American Primitivism, a term borrowed from painting and referring mainly to the self-taught nature of the music and its minimalist style. Acoustic. Time Signature 4/4. 57 measures. 4 pages. tuning 6=f.